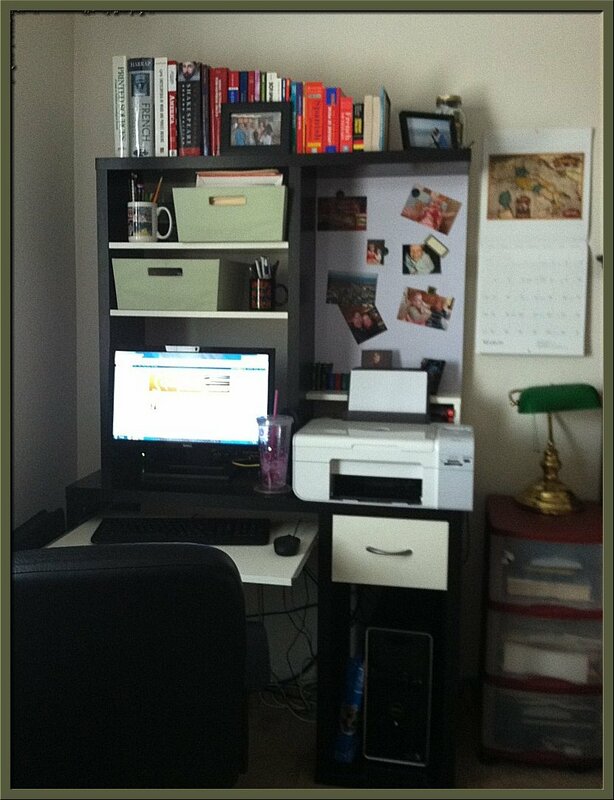 Scene of the Blog Featuring Jessica of The Quirky Bookworm! If I'm not mistaken, I discovered this week's featured blogger by a comment she left on a blog. Or she may have been on someone's blog roll. (I have all sorts of ways to discover book bloggers....) This time I was forced to follow her to her lair because she uses one of my favorite words in her blog name. That she's another Arizona blogger is just icing on the cake. Have you visited Jessica at The Quirky Bookworm? (Yes, "quirky" is one of my favorite words!) If you have, then you know that her blog is all about the books she and her young daughter love. Since her daughter is in the toddling stage, Jessica covers quite a range of books. Her April Fool's post made me laugh out loud because I could just hear all the indignant exclamations from folks who read it! If you haven't had the pleasure of reading through the posts of The Quirky Bookworm, I urge you to take this opportunity to pay a visit. Don't forget to say hello while you're there! 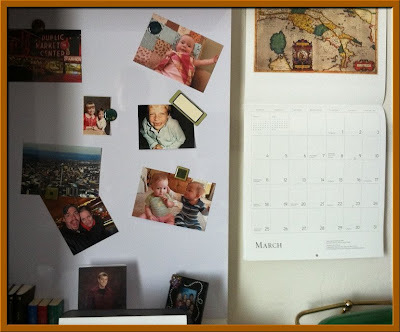 If you're visiting from Jessica's blog-- Welcome! If you'd like to see any of the photos in larger sizes, all you have to do is click on them and they'll open in new windows. And if you'd like to see the blogging spaces of other participants, click on the Scene of the Blog tab at the very top of my header. There are two ways to sample: by blog name, or by location. I'm glad you're all here. Jessica's ready to take us on a little tour, so let's not keep her waiting! My "office" is a desk in the corner of our bedroom. We bought it at Ikea, and I'm quite proud that I assembled it by myself when I was 7 months pregnant! She's got her computer and a drink, so she's ready to blog! The desk has bins of useful office items, reference books, and cute pictures of my daughter and husband. I have a calendar hanging to the side so that I can schedule posts in advance. I usually have either a big glass of water or a diet Coke, and I generally blog midafternoon while wearing headphones and listening to Pandora (so as not to wake the napping baby in the next room). We only have the desktop computer, so I am anchored to one spot. Someday it would be great to have a laptop so I could move around and blog in different places! For now, I occasionally go to the library and use computers there, but 98% of my blogging is done sitting in that black chair. 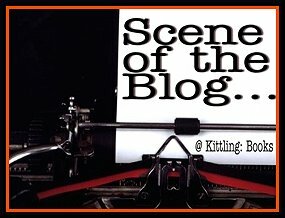 And that's my Scene of the Blog! And we're so glad that you shared it with us, Jessica! Having put together dozens of pieces of "flat pack" furniture all by my lonesome, I am indeed impressed that you put that desk together by yourself when you were seven months pregnant! I'm a dinosaur set in my ways. 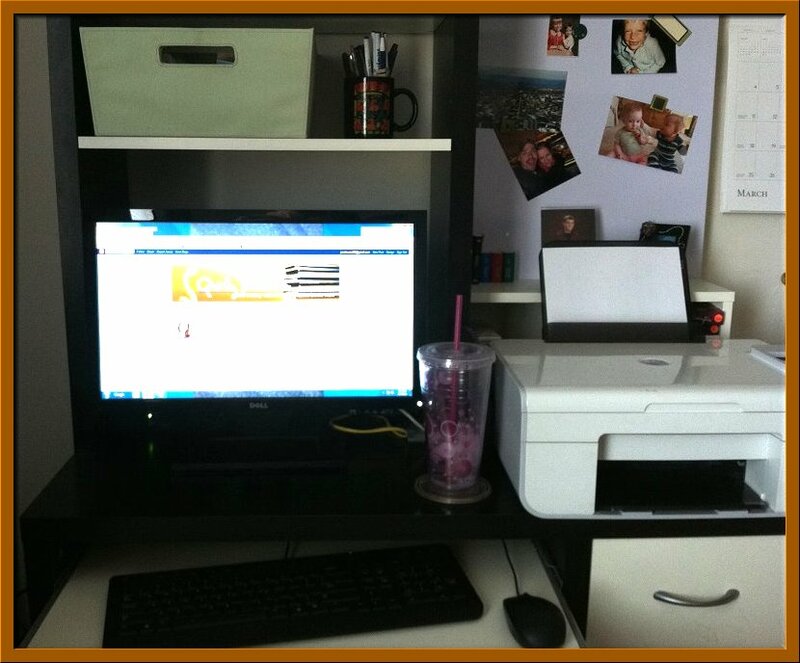 So many other bloggers are mobile with their laptops, but I prefer my desktop with two big monitors. I sit here during the wee hours of the morning and blog to my heart's content, either appreciating the silence or enjoying some of my favorite tunes. I suppose I might change my mind if I had a laptop. Anything's possible-- since I never thought I'd like using an eReader, and I love my Nook! Once again, thanks for sharing your creative space with us, Jessica. Keep up the excellent work on The Quirky Bookworm! Thanks Kay! I was so proud of myself for completely assembling it! I love Jessica's space! Nice and compact. By the way, I'm a dinosaur too. I do have a laptop but prefer my desktop. Thanks Cathy! It is funny how often I find other bloggers by their comments...when I keep seeing the same names crop up in comments on different blogs I have to go check it out! I'm a bit envious of that IKEA desk. Looks very efficient. I have a netbook but I do all my work and blogging from a desktop. I need my ergonomic keyboard and big monitor. I quite recommend the desk! It wasn't too expensive, and I love that it uses much more vertical space than horizontal space.